Eva Longoria Eva Longoria spoke at the Democratic National Convention in 2012 in support of President Barack Obama and will introduce New Jersey Senator Cory Booker the first night of the DNC this year. 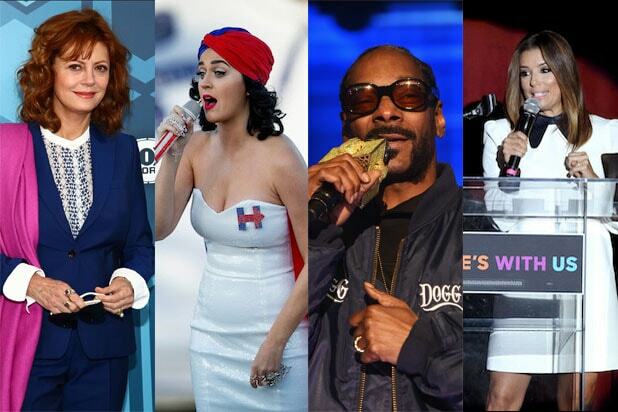 Katy Perry Katy Perry has showed her support for Clinton from day one. Her hit song "Roar" has become one of Clinton's unofficial campaign anthems. Shailene Woodley Fresh off her cross-country pro-Sanders road trip from Los Angeles to Philadelphia, the "Divergent" star is working to keep Sanders' "political revolution" alive. Woodley arrived in the City of Brotherly Love on Sunday, where she headlined a rally for climate change along with Susan Sarandon and Danny Glover. Rosario Dawson Rosario Dawson, perhaps the most forthright Hollywood Sanders supporter, said she is heading to Philadelphia to protest the DNC after internal party emails released by WikiLeaks suggested the DNC favored Clinton over Sanders during the primaries. Demi Lovato Demi Lovato has been on #TeamClinton from day one, lending her voice and her hit song "Confident" to the Clinton campaign during a rally in Iowa earlier this year. Susan Sarandon Oscar winner Susan Sarandon has been one of Sanders' biggest die-hard supporters in Hollywood, coming under fire for saying that Clinton could be "more dangerous" than Donald Trump and that she wasn't sure whether she'd vote for Clinton in the general election. Tony Goldwyn Looks like another U.S. President wants to see Hillary in the White House. Goldwyn, best known for playing fictional president Fitz Grant on ABC's "Scandal," helped the Clinton campaign last December in Iowa and will be speaking at the DNC. Elizabeth Banks Banks tweeted on July 20 that she would be joining America Ferrera, Eva Longoria and Lena Dunham at the DNC. The actress-producer-director also appeared at a Clinton rally at West Los Angeles College in June. Debra Messing A strident Clinton supporter, Messing got into a Twitter feud with Bernie Sanders supporter Susan Sarandon last March. Sarandon had suggested in an interview on MSNBC that she would consider voting for Trump over Clinton if Sanders lost the nomination. Both Messing and Sarandon are set to appear at the DNC, so keep an eye on their Twitter accounts. Snoop Dogg Snoop is set to headline the DNC's "Unity Party" at the Electric Factory on Thursday. The rapper announced last year that he's voting for Clinton in the election. Kareem Abdul-Jabbar The retired NBA player tweeted his support for Clinton and also penned an op-ed in Time magazine last December explaining how Donald Trump and ISIS shared several similarities. Lady Gaga Lady Gaga has been on Clinton's side since the early days of the campaign and has continued to voice her support since. Along with Lenny Kravitz and DJ Jazzy Jeff, Gaga will headline a concert in New Jersey on Thursday for DNC delegates and guests. Alicia Keys The singer is set to participate on a panel hosted by Politico about criminal justice reform and civil rights, after which she will perform. Keys and Jay Z's "Empire State of Mind" has also been used as a Clinton victory song during the New York primaries. Bryan Cranston "The Infiltrator" and "Breaking Bad" star will be a featured guest at a DNC luncheon hosted by House Democratic leader Nancy Pelosi. Though Cranston is a Hillary supporter, the actor has praised Trump's candor in the past. Lena Dunham Lena Dunham has been one of Clinton's most vocal supporters in Hollywood. The "Girls" creator and star not only joined Clinton on the campaign trail, but has even taken over her Instagram account for a day. America Ferrera America Ferrera has been a die-hard Clinton fan ever since her 2008 presidential run. On the day Clinton announced her second bid for the presidency, Ferrera tweeted a picture of herself stumping for Clinton in 2008 along with the caption, "I believed in her then, I believe in her now."